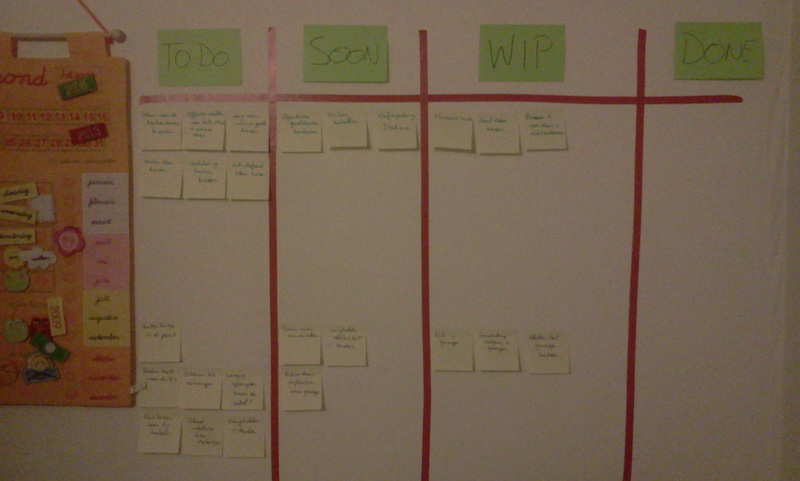 I admit, I’m taking this personal kanban (#pkflow) thing to the next level. Because we only do work around the house in the weekends and only when we’re home *duh* I decided to create a separate kanban just for the construction, renovation and DIY tasks at hand. I choose one color pen specifically for all the work that we will be doing for the renovation of our kitchen. This renovation will start in a week or two and I’m already feeling extremely excited. But more about the kitchen later, first let’s focus on the topic of this post. I’ve worked with different kanban systems for over a year, trying to find the best solution for my renovation work. Putting it on the table, on a cupboard in the living room, let’s summarize as where there was some room left. This didn’t really work out of course, not a big surprise there. So this Tuesday on my way to the WeBBT conference I was scheduled for two workshops around personal kanban, it hit me. why not put up a new kanban in our laundry room, which we pass by every day to go to the bathroom. Here I could visualize the upcoming DIY tasks, which we need to fix and the kitchen reconstruction actions that we hire people to do. And this is the result so far. I know, I still need to add a WIP limit, I promise I’ll put in on there this weekend. I’ll keep you informed about how this works out. We already have a first test on Sunday when my dad is coming over to help me out again. And next Monday we will have our first meeting with the contractors who will do most of the work in preparation of the new kitchen. It might be better not to use the kanban with them, my dad-in-law is probably going to think I completely lost it. I’ll let you know how those two first experiments turned out.